Between online discounts and in-store doorbusters, there's almost an Advent calendar's worth of upcoming Microsoft deals. Black Friday and Cyber Monday may have come and gone. 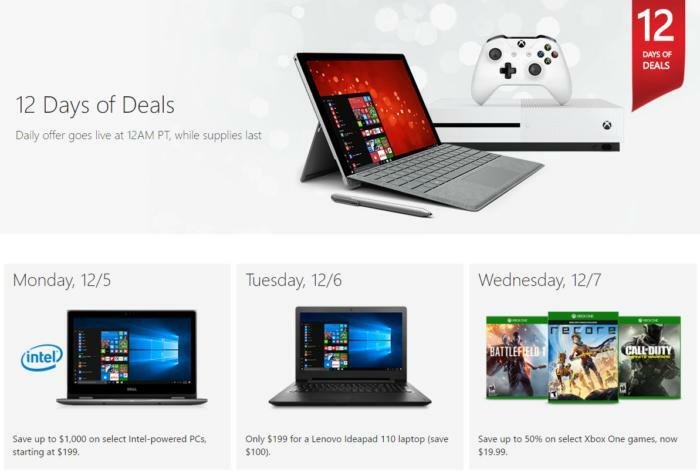 But that hasn’t stopped Microsoft from publishing some fairly amazing deals over the next 12 days, half of which you’ll need to visit a brick-and-mortar Microsoft store to score. Some of the deals are well worth the trouble. Microsoft will offer up to $1,000 off on select PCs on two separate days, for example, and there are a number of half-off deals on Xbox One games, too. Another intriguing deal is a $49 Windows tablet on Friday, December 9. Microsoft’s best deals, however, are shrouded in mystery: The company isn’t revealing which tablet will be $49, or what PCs it will be discounting by $1,000. Why this matters: Apple got in on the Black Friday deals this year, offering gift cards for $150 off Macs, and smaller amounts for the iPad Pro, Apple Watch, and others. But Microsoft is going way beyond that, not only with its own products but those of its partners, too. Below, we’ve listed each daily deal as well as our comments. More than 2,000 reviewers have given JBL’s Flip 2 portable speaker an average of 4.5 stars on Amazon, so if you’re looking for a Bluetooth speaker, this is a great deal. And $1,000 off a PC is worth a visit to the online store, too—the big discount is on the Alienware 15 Touch Signature Edition, for $1497.00—and with nine free games, too. PC prices begin at $199, though the $199 offer could apply to the Lenovo Ideapad 110, which is Tuesday’s deal. We’d probably skip this deal, unless you’re in the market for a FitBit. We reviewed the Lenovo IdeaPad 100 last year, and this is a cheap notebook designed to compete with Chromebooks. We weren’t especially fond of it. Microsoft isn't discounting every game by 50 percent, but there are some solid deals here. Sure, prices start at $19.99 for ReCore and Project CARS, including a ton of "closeout" prices. But the biggest deal we've seen is $30 off for Titanfall 2 ($29.99), Call of Duty: Infinite Warfare ($29.99) and $20 off both FIFA 17 and NHL 17, both down to $39.99. We're also not seeing these prices on the Xbox Store at press time, so you'll have to make sure you visit the Days of Deals page on the Microsoft Store page instead. You can also get a $25 Microsoft Store gift card with the purchase of an Xbox One Elite Wireless Controller, and if you buy a new Xbox One S console, you'll get an extra controller as well as a free game. This deal on Groove Music is solid, even though the $50 discount comes in the form of a Microsoft Store gift card. Groove is normally $99 for a one-year subscription, and some of the “Your Groove” features have put it on par with Spotify. I personally consider an Intel Core M to be the minimum threshold for Windows tablet computing, with enough horsepower for home and office work and even some rather light gaming. We’ve reviewed a number of solid Core M tablets, including the HP Elite x2. They’re not all that cheap, so a discount makes sense. Sort of oddly, the linked discount is just the Surface Pro 4 with a Core m chip inside it. Nothing wrong with that! And the default deal -- 128 GB of storage, 4 GB of RAM -- is $250 off, for a price of $649. That's not bad at all. Other Surface Pro 4s with a Core m chip are discounted, too. The Xbox Live Gold doorbuster discount is also a gift card. There are a number of cheap alternatives to an annual Live Gold sub, so this doorbuster is less impressive. Heck, with Microsoft Rewards, you can get Live Gold for free. The big deal today is Microsoft's $49 tablet: a NuVision 8-inch Windows tablet, powered by an anemic "Bay Trail" Atom chip from 2014, that'd you'd be advised to steer clear of. Don't buy it; the Bay Trail Atoms are simply too slow to consider buying, even as cheap as they are. Instead, the deal you should consider is this $59 NuVision tablet, which has a more powerful "Bay Trail" Atom chip inside. That x5-Z8300 Atom chip inside the $59 tablet is just a hair slower than the Asus Transformer Mini we recently reviewed, but at $59 it might be worth it. Note, though, that the NuVision is just a tablet, and lacks a keyboard, mouse or a kickstand. There's also a ton of other, more minor notebook deals on the Microsoft Store site. Check them out here. The Lumia 650 doorbuster, though, is sort of a throwaway. Windows Premium Collection notebooks and tablets are curated by Microsoft, and ship free of the third-party crapware that can plague devices sold by retailers. This alone can be worth it. Microsoft isn’t specifying the Office discounts though, so I’d stay home for this doorbuster. Another intriguing day of deals, especially if you’re in the market for a new Xbox. Again, there’s no indication if the Xbox One S is in play here, or if this just applies to older models. Why not score yourself a free gift card, though, and ask them in person? Just be there early. Microsoft’s offering a $100 gift code or card with the purchase of an HTC Vive ($799) or Oculus Rift ($599) with in-store demos. The doorbuster is an undisclosed deal on the FitBit Charge HR. Blah. Another deal worth checking out online, even if we don’t know yet what the gaming PCs on offer will be. Prices begin at $799, though. The $19.99 doorbuster applies to Quantum Break, Halo 5, and Forza Motorsport 6, all of which are big-budget titles that mostly deliver. Prices begin at $199 for these Dell PCs, all of which are part of Microsoft’s no-crapware Singature Edition series. (No, we don’t know which models.) The doorbuster is Acer’s Liquid Jade Primo Windows phone, whose mediocre camera really puts a damper on the deal. Updated on Dec. 9 at 10:08 AM PM with Microsoft’s $49 tablet deal.